Tags are a great way to organize and manage your audience. The Tags page in your list lets you manage your tag structure, add or delete tags, view contacts assigned to tags, and more. In this article, you’ll learn how to access the Tags page and what tools and tasks are available to you there. Tags are taking the place of static segments in Mailchimp. If you previously created static segments, we’ll automatically convert them to tags for you, and you'll find them on the Tags page in your audience. Don’t worry, you'll still be able to send to your newly minted tags just like you always have. We still have regular segments that automatically update as contacts meet the criteria you choose. And guess what? Now you can segment based on tag data! To access the tags page, follow these steps. Navigate to the Lists page in your account. Click the name of your list. Click the Manage contacts drop-down menu and choose Tags. Cool you’re there! Read on to learn about the options available on the Tags page. When you view your tags on the Tags page, we’ll automatically sort them so your most recent tags appear at the top. To change the order and sort your tags with the oldest tags appearing at the top, click the Arrow icon. To view which contacts have been assigned a tag, click View, and we’ll display a segment that shows only contacts with that tag added to them. To view the options for each tag on the Tags page, click the drop-down menu next to the View button. Send Send an email campaign directly to contacts that are assigned to that tag. To target these contacts with a different type of campaign, first view the contact segment. Learn more about sending to tags. Rename Choose this option to change your tag name. This won’t affect the contacts the tag is assigned to. Delete Choose this option to delete a tag from your list. Tag deletion is permanent, so we’ll ask you to confirm you want to delete your tag in a pop-up modal. Deleting a tag does not remove any contacts from your list, but it does remove that tag from those contacts. 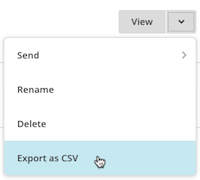 Export as CSV Choose this option to download a CSV file of the contacts assigned to that particular tag. We’ll use your tag name as the title of your export. From the Tags page, you can also create a new tag to use later, or create a tag, and assign it to multiple contacts on your list in bulk. Learn more about how to create tags. Tags are labels you create to help organize your contacts in Mailchimp. Learn how to use tags, where to find them, and how to get started. Learn how to create and assign tags to your contacts to organize your audience, or remove them if you need to. Learn how to send targeted campaigns to tagged contacts in your audience.